Interview with Mr Adhi Lukman, President of GAPMMI, the main association for food industry sector professionals in Indonesia. WHAT IS YOUR VISION OF THE MARKET? It is a market that today finds itself at the crossroads. Still predominantly local, it is becoming increasingly internationalised, both in terms of production and distribution. Although it is still a young market, it is growing in maturity year on year. The role of our industry is, precisely, to help the market become more professional, and meet the expectations and needs of a growing number of consumers, with three guiding principles: food safety, food innovation, and healthy competition. WHAT ARE THE PROSPECTS FOR THE INDONESIAN MARKET? They are highly promising. In 2016, the Indonesian GNP grew by 5.02%, while our sector recorded growth of 8.46%, and investments increased by 40%! Another explanation for this dynamism is that population growth in Indonesia exceeds 1.5% per year! HOW DO YOU SUCCEED IN INDONESIA? By taking account of the local characteristics and assets of our country. The leading ASEAN market, Indonesia serves as a production base camp for the food industry sector. Committing to Indonesia inevitably means projecting out towards the rest of the ASEAN countries. To succeed here, you need to test new products, offer visibility to craftsmen and manufacturers and, of course, build up partnerships. The best stepping stone for conquering Indonesia? 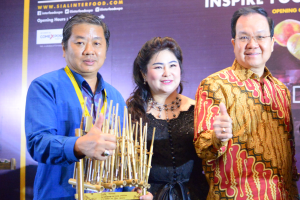 SIAL Interfood, one of the main trade fairs in ASEAN.